DETAILS This is a little tricky, requiring patience, and skilled fingers. A nimble fingered eight year old might be able to do it, but perhaps better to wait until 10 or older depending on the individual. 1. Wrap the end of a pipe cleaner or 6 inch wire with a small piece of cotton batting. You could substitute a bit of wadded kleenex. All you want to achieve is a little volume. Attach with masking tape. Wrap with tissue paper and glue. You’ve just given your flower a stamen. 3. Layer the strips and fold in half crosswise. Continue folding until you have, approximately, a 2 inch wide rectangle. With scissors, round the edges on one side. this will be the "up" side. 4. With one hand, loosely wrap the tissue paper strip by strip around the pipe cleaner/slash wire, gathering it at the bottom with the fingers of your other hand. When all strips are wound, wrap with masking tape. 5. Carefully pull the layered petals outward to give the flower fullness. 6. Cut leaf shapes from green crepe paper. Tape a six inch piece of wire to one leaf, glue another leaf on top of this. Wind leaf wires around stem. Finish by wrapping green crepe paper over exposed wire/pipe cleaners. Affix the end with glue. 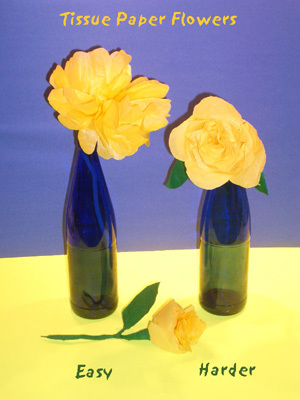 Click for easy tissue paper flower project. SKILLS NEEDED Manual dexterity, skill with scissors, patience.